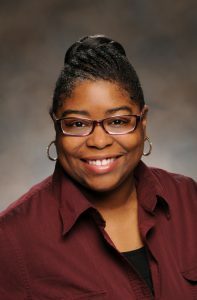 Dr. Delisha Stewart received her PhD in Biochemistry from the University of Alabama at Birmingham. After completing a postdoctoral fellowship at UNC-Chapel Hill in 2013, using genomics to investigate stromal immune factor contributions within the tumor microenvironment on breast cancer subtype aggressiveness, she joined the NIH Eastern Regional Comprehensive Metabolomics Resource Core (ERCMRC) as a post-doc at RTI International to learn metabolomics. She uses genomics, metabolomics and high-throughput molecular bioassays to study the interplay between the immune system and malignancy, metabolic dysfunction in cancer and immunological diseases and the influence of nutrition on cancer health disparities. She joined the Nutrition Research Institute in March 2017 as a Research Assistant Professor, relocating with the ERCMRC and continues to lead all cancer and immunology-focused studies. Her research aims to better characterize etiological and progressive microenvironments of breast and other types of cancers, identify diagnostically and therapeutically relevant biomarkers and determine the role of altered nutritional states on cancer health disparity treatment outcomes.